Sooo, I have my computer science exam on Monday, but I do not really know where to begin studying. 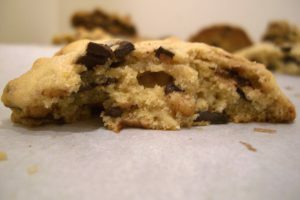 Instead, I am joining the quest of baking bloggers around America to recreate the Levain Bakery cookies. The ironic thing is that I could get on a subway, go uptown, and buy a Levain cookie , rather than looking at pictures online. I would not even have to change trains, BUT I’m just not that motivated. 1. Preheat oven to appropriate temperature (see Step 4). [I toasted the walnuts for 7 minutes here because I prefer toasted nuts but it is not necessary.] Line a baking sheet with parchment paper. 2. In a small bowl, whisk together the flour, salt and baking soda. In a medium bowl, beat the butter with the granulated sugar and brown sugar. Add in the egg and molasses and beat until well mixed. Slowly add in the flour mixture. 3. 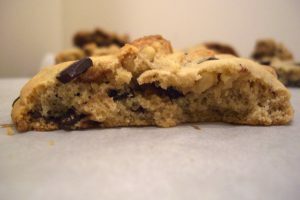 Stir in the chocolate chips and walnut halves. b) set oven to 375oF and bake for 8 minutes, then lower to 325oF and bake 12 minutes more. 5. Cool on baking sheet 1 minute and transfer to wire racks to cool completely. Review: These tasted very molasses-y (not a real word, but you get the idea). They were really moist, but…they tasted very molasses-y. That is not a bad thing if you like molasses, but when you are striving for a huge classic chocolate chip cookie, it kind of is. 2. In a small bowl, whisk together the flour, salt, baking powder and baking soda. In a medium bowl, beat the butter with the granulated sugar and brown sugar. Add in the egg and vanilla extract and beat until well mixed. Slowly add in the flour mixture. 5. Cool on baking sheets 1 minute and transfer to wire racks to cool completely. Review: These were really awesome. Before baking them as indicated in part b), I refrigerated the dough for about 10 minutes, and they held their shape. 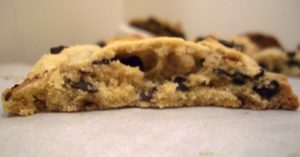 The difference between a) and b) is that a) produces a cookie that is crispy on the outside and chewy on the inside, whereas b) yields a cookie that is mostly chewy throughout. 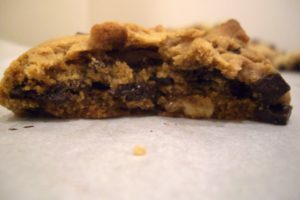 Although I am usually partial to a chewy cookie, I really enjoyed a). Review: These spread a bit more than the other ones, even after some refrigeration. The ones baked at 325o first spread less than the ones baked only at 350o. 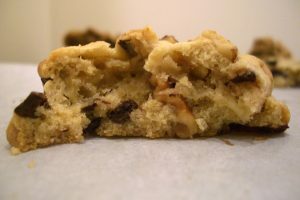 Taste-wise, I believe that the ones baked according to b) come the closest to the Levain cookies (cake-like texture, that is) – hardly a surprise, considering that half of the flour was cake flour. I think that if I added more chocolate, they would be Levain doppelgangers. Yes, that’s an odd name but these really do have “everything but the kitchen sink” in them. 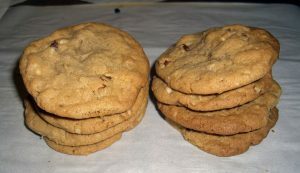 I started by reading a recipe for “Chewy Chocolate Coconut Cashew Cookies,” which I eventually managed to mutate into “Pecan Butterscotch White Chocolate Coconut Cookies”. I really wanted something with butterscotch and toasted pecans (I’m literally so in love with them that I make them and freeze them), but I ended up basically opening my cabinets and tossing stuff into a bowl. 1. Preheat oven to 350oF. Toast the pecans on a baking sheet 8-10 minutes, or until fragrant. Set aside to cool. Line two baking sheets with parchment paper. 2. In a medium bowl, stir together the flour and baking soda. 3. In a large bowl, beat butter, brown sugar, and granulated sugar until creamy. Add the vanilla followed by one egg at a time and beat until light and fluffy. 4. Stir the flour mixture into the larger bowl. Stir in coconut and pecans, followed by the pecans and white chocolate chips. 5. Drop heaping round tablespoonfuls onto ungreased baking sheets. Bake ten minutes or until cookies have spread and are done on the outside and a bit moist on the inside. Cool about a minute on baking sheets, then move to wire racks to cool completely. 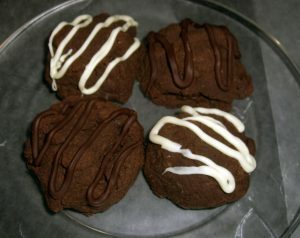 Generally if people, such as myself, enjoy cookies, they generally enjoy other kinds of sweets, like CANDY! In terms of non-chocolate based candy, I really like Skittles, jelly beans and a particular type of Eastern European candy called “Krowki” (that’s the Polish spelling – it means cow, I think). Pure chocolate is rather different. For example, I typically prefer Cadbury’s to Hershey’s, except for s’mores, although the Cadbury’s recipe has been perverted for distribution in America. I also like Krasniy Oktyabr’ products (and the smell they give to certain areas of Moscow). For baking, I typically use Baker’s chocolate, I recently discovered a brand called Scharffen Berger which is really good for things that really emphasize the flavour of the chocolate, like the torte I made for Passover. 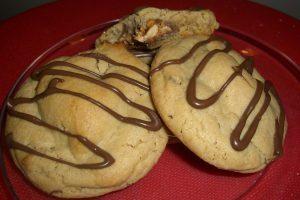 Anyway, this cookie is a Mars-product themed creation, using Snickers bars and Dove chocolate. Ordinarily, I do not use Dove but someone I know was describing her love of Dove to me, so I decided to give it a try. I was pleased. These are really simple to make, which is nice – I started them at 10:30pm after coming home from a concert and I was completely done by midnight. 1. Preheat oven to 350oF. Line 2 baking sheets with parchment paper. 2. In a medium bowl, whisk together the flour, baking soda, and salt. In a large bowl, beat the peanut butter and butter together until well mixed. Beat in the sugar until the mixture is light and fluffy. Add in the egg followed by the milk and honey. 3. Mold about 1 tbs of dough around each piece of candy. 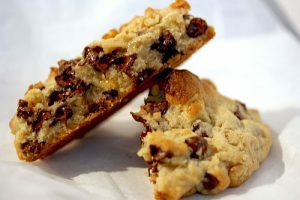 You do not want there to be a lot of extra dough because then the cookie will spread when you bake it, and if there is too much dough, then it will overwhelm the candy center. 4. 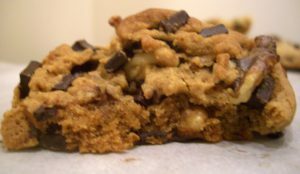 Place on the prepared cookie sheets and bake for 12-14 minutes. Remove and transfer to wire racks to cool completely. corner and squeeze in drizzles over the cookies. It will set after it cools.